At 17:57 SG II was spotted from Defence and Warrior. Opened fire but shells landed short. Closing in (and passing so closely across Lion&apos;s bow that the latter was force to swerve), SMS Wiesbaden was spotted and fire opened. 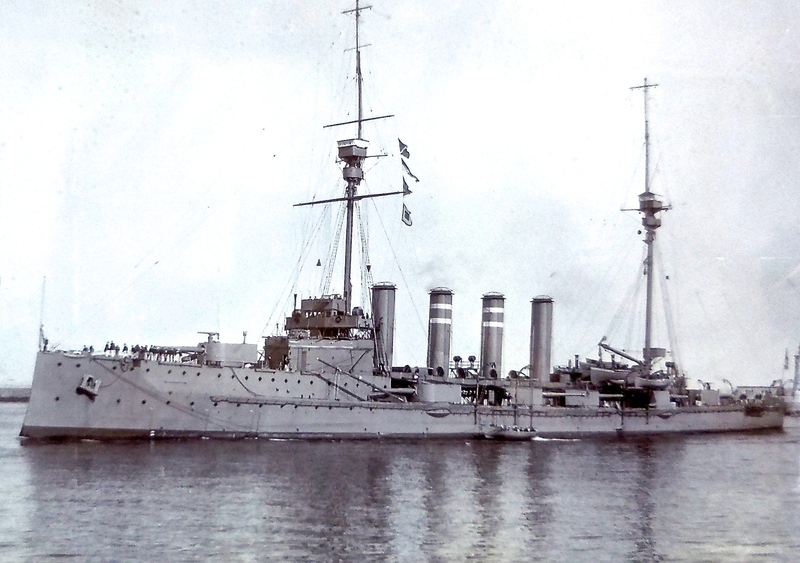 At 18:05 and at 5,500 yards range the two armoured cruisers were spotted by SMS Derfflinger and 4 battleships a little further away (7,000 yards). By 18:20 the fire had been so accurate, that Defence blew up. Warror herself had been hit by six 15 cm (5.9") shells and "at least" (Wiki) 15 28 cm (11") heavy shells. Warrior was only let alone when HMS Warspite was spotted turning with a jammed rudder and fire was re-trained. HMS Engadine took off 743 survivors. She was abandoned at 08:25 on June 1st and gradually sank. 2 shafts, 4 cylinder Triple Expansion steam engine. 19 Yarrow water tube boilers and 6 cylindrical boilers. Rated performance 23,650 shp.